These Charcoal - Recycled 100 Bright White 120lb Classic Columns Duplex Covers are embossed with a wonderful vertical pattern that provide elegance and long-lasting impression to your report, presentation, project or proposal. 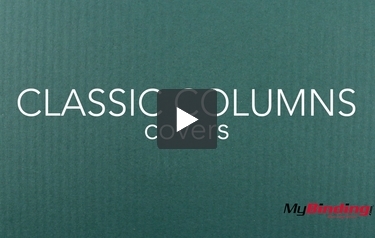 Classic Columns Cover offers a unique communication medium with both visual and aesthetic appeal. Our window covers have a 1.75" x 4" window that is centered on the front cover 3" from the top edge. Classic Columns Duplex Covers are all acid-free for archival quality, Green Seal and FSC certified.